Have you seen Ngā Rerenga o Te Tiriti? 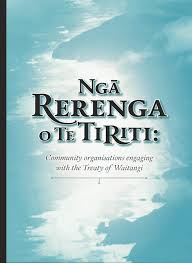 It is a resource for community organisations in Aotearoa that have been established under the authority of the New Zealand government, and whose rights and responsibilities are linked to those of the Crown. If your organisation is clear that it wants to enhance its engagement with the Treaty, we recommend you check out this valuable resource. Source: Treaty Resource Centre 2016. This work is licensed under a Creative Commons AttributionNonCommercial-ShareAlike 4.0 International License. You are free to copy, distribute and adapt the text for non-commercial purposes, as long as you attribute the text to the author and share it under the same conditions.